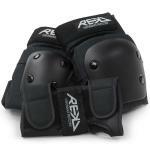 A good quality skateboard helmet and set of knee pads, elbow pads and wristguards are a must when learning to skateboard. Even for the more experienced skateboarder many indoor parks advise wearing helmets. We stock a range of skateboard helmets in both youth and adult sizes from Bullet and Pro-Tec. Both are Bullet and Pro-Tec manufacture high quality protection, Pro-Tec have been market leaders in producing skateboarding protection since the '70s, and Bullet provide a great alternative for those on a budget.